COLOMBIA: A car bomb exploded in front of a Bogotá police academy yesterday, killing at least 21 people and wounding dozens. The attack at the Santander General School may have been a suicide bombing, an act of violence that would be unprecedented in Colombia’s history. Police identified the deceased suspect as José Aldemar Rojas Rodríguez. The bomb left shrapnel in nearby buildings and blasted the leaves off trees and tiles off roofs. President Iván Duque called it an “attack against society” and said those behind the “demented terrorist attack” would be punished. 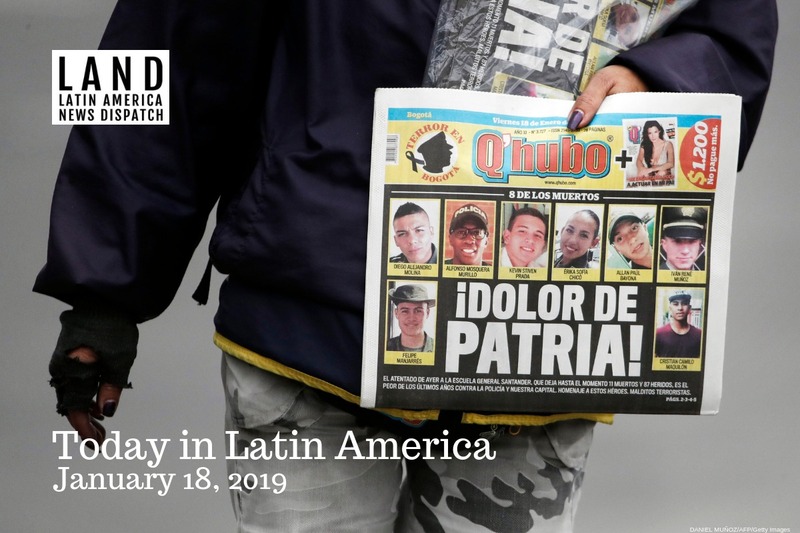 The attack sparked fears about a return to Colombia’s past, when car bombings were frequent during the conflict between drug traffickers and leftist guerrillas. The National Liberation Army (ELN) has recently increased attacks on police in Colombia amid a standoff with Duque over restarting peace talks. The group has not been named as responsible for the Bogotá attack, however. Peace talks between the ELN and the government stalled when Duque took office in August. UNITED STATES: The Trump administration is considering resuming punitive policy toward Cuba. In a statement on Wednesday, Secretary of State Mike Pompeo announced that the United States might allow a clause of the 1996 Helms-Burton Act to take effect, which would give Americans the right to sue companies profiting from property confiscated by the Cuban government during the Cuban Revolution. Previous presidents had suspended the clause, as many of these companies are from U.S.-allied countries such as Spain. UNITED STATES: A group of democratic House members asked President Trump yesterday to impose sanctions on the government of Guatemala, as well as to suspend assistance to the country. The group was led by Reps. Norma Torres and Jim McGovern. This comes just 10 days after Guatemalan President Jimmy Morales moved to expel the anti-corruption CICIG group from the country. MEXICO: In response to President Andrés Manuel López Obrador’s efforts to increase the military’s role in policing, the lower house of Mexico’s Congress passed a measure yesterday to create a National Guard. López Obrador criticized the action, referring to the proposal as a “replay of the Federal Police, which we already know didn’t work.” He called on the Senate to modify the measure and reinsert language putting the military in charge of the guard’s training. GUATEMALA: Yesterday, a court ruled that no CICIG officials will be involved in the trial against President Jimmy Morales’ son and brother, a result of the government’s unilateral termination of the commission’s mandate. Three judges ruled that Amanda Trejo, a prosecutor representing CICIG, will no longer participate in the case launched by former Attorney General Thelma Aldana. Sammy Morales and José Manuel Morales Marroquín have been worth $23,000 since August 2017. HAITI: Two years after filing a lawsuit against the United Nations on behalf of 10 women who had children fathered by U.N. peacekeepers, a Haitian human rights group denounced the United Nations for failing to help the mothers seeking child support. The Bureau des Avocats Internationaux (BAI) and the Institute for Justice and Democracy in Haiti (IJDH) released a statement condemning the U.N.’s “lack of cooperation” with the mothers since 2017. 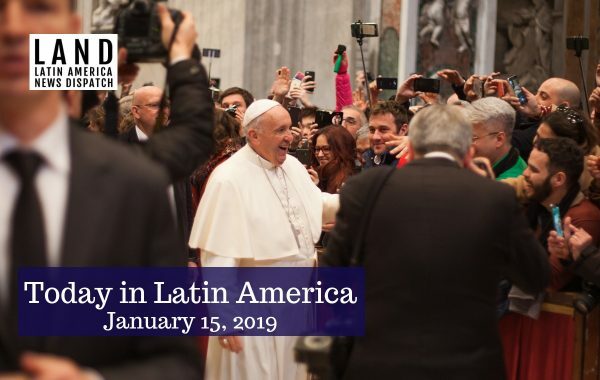 According to the IJDH director Brian Concannon, women in Mali, the Central African Republic, and the Democratic Republic of the Congo are experiencing similar challenges. PUERTO RICO: The Federal government shutdown mighta critical case concerning Puerto Rico’s debt restructuring. The trial, which ended inconclusively yesterday, accounts for about a third of the island’s debt and involves tax questions. The shutdown has affected the Internal Revenue Service (IRS). If approved, Puerto Rico’s government will pay $32 billion over four decades. In addition to uncertainty over its debt restructuring, the island is still recovering from Hurricane María. New information surfaced yesterday about an attempt by President Donald Trump to withhold Hurricane María relief funds from Puerto Rico. And on Wednesday, the White House objected to a $600 million relief package aimed for food assistance, calling it “excessive and unnecessary.” Governor Ricardo Rosselló condemned the decision through a video message addressed to the president. JAMAICA: Using reggae jingles, Jamaica’s Central Bank launched a campaign to communicate its inflation goals for 2019. Following legislation signed in September 2017, the bank expects to reach an inflation rate between 4 percent and 6 percent. Currently, inflation sits below that objective at 2.4 percent. The video series, first released at the end of last year, has been disseminated via the Bank of Jamaica’s official social media account. VENEZUELA: Twelve officials in Venezuela’s intelligence agency have been charged after the leader of the National Assembly was arrested Sunday, causing international outrage. 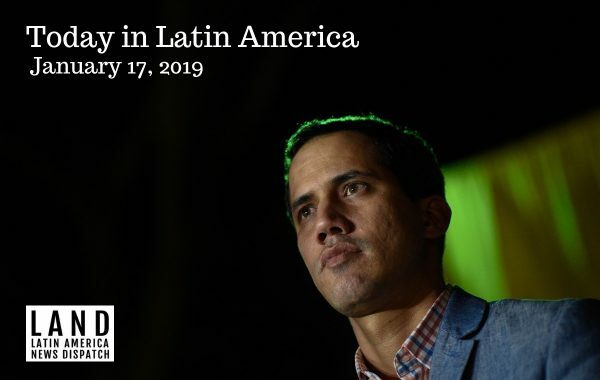 The charges include “illegitimate detention” and “abuse of functions.” Juan Guaidó was briefly detained as he headed to a town hall meeting against the administration of President Nicolás Maduro. Guaidó is pushing Maduro to step down, a move encouraged by several world leaders, including President Trump. BRAZIL: The country’s new environment minister, who once described climate change as a “secondary” issue, suspended all agreements and partnerships with non-governmental organizations. Critics condemned the move as an attack on the environment and those trying to protect it. 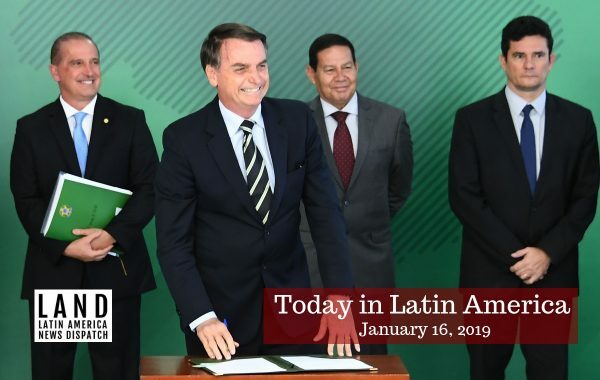 Ricardo Salles, who was appointed by President Jair Bolsonaro, said the suspension will allow the ministry to re-evaluate those agreements and partnerships. Other members of Bolsonaro’s cabinet have expressed similar attitudes toward the environment and its advocates. The agriculture minister recently called Brazilian supermodel and environmental activist Gisele Bündchen a “bad Brazilian” because of her activism. Bündchen responded to Tereza Cristina Dias in a public letter, saying the real “bad Brazilians” are those promoting deforestation and illegal land occupation. BRAZIL: The rights’ group Human Rights Watch criticized Bolsonaro’s plan to “pile on” more inmates in Brazil’s crowded prisons as a solution to budget constraints. The country’s prison population is already double the listed capacity. The group also condemned Bolsonaro’s encouragement of shoot-to-kill policies for police, citing Rio de Janeiro’s 1,444 police killings last year.